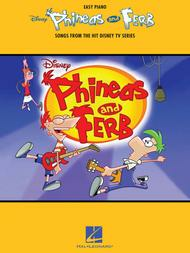 Phineas and Ferb (Songs from the Hit Disney TV Series). Composed by Various. For Piano/Keyboard. Easy Piano Songbook. Softcover. 96 pages. Published by Hal Leonard (HL.316185).ISBN 1458421937. 9x12 inches.Easy piano arrangements of more than two dozen tunes featured in the hit Disney Channel animated series whose music has been nominated for multiple Emmy Awards. Includes: Ain't Got Rhythm • Backyard Beach • Busted • Chains on Me • Gitchee Gitchee Goo • He's a Bully • I Love You Mom • My Nemesis • Perry the Platypus Theme • Queen of Mars • S.I.M.P. (Squirrels in My Pants) • Today Is Gonna Be a Great Day • Truck Drivin' Girl • and more! Features a special section of full-color art from the show!